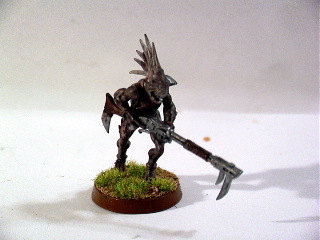 How to paint a Kroot Mercinary! 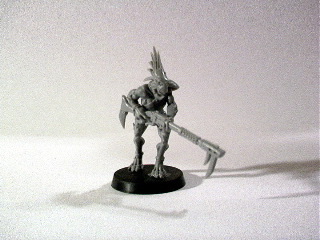 Kroot are very interesting when putting together. Choose the assortment of pieces you want to use, and glue them together all at once so that you might line them up for "assembly line" painting. 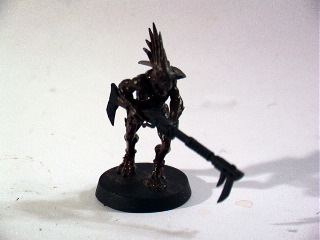 Step One after assembly is to spray your model Chaos Black. Now we water down some Codex Grey and brush it across the skin. 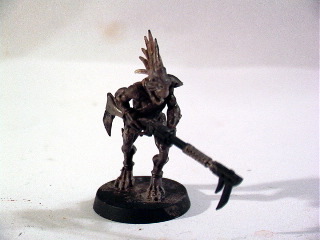 Pick out any detailed bits with Bleached bone, such as the spines coming out of the legs. Now we paint the metal bits of the gun Boltgun Metal, and use Snakebite Leather for the leather wrapping. Go ahead and ink wash the face with Black Ink if you want that extra bit of detail. Then finish off the model with a basing selection of your choosing. Painted a miniature already? Have pictures? Send them in! We'll feature them in our Games' Workshop customs gallery! Just drop em to Havens@TheOneRing.net and we'll put the best models up for all to enjoy!